According to a recent Bloomberg article highlighting Oil World predictions, soybean prices will likely tumble in the next several months as U.S. farmers plan to expand acreage and prospects improve for South American crops. U.S. farmers are expected to supplant corn acreage with soybeans in 2014 as corn prices recently fell to $4.0625 a bushel on January 10, the lowest price since August 2010. In addition to the expected U.S. expanded acreage, there is an increasing likelihood that Brazil’s record harvest will surpass 90 million metric tons and Argentina’s crop will also be at an all-time high. Keith Alverson, a sixth generation corn farmer from South Dakota, is just one of many American farmers expected to increase soybean acreage this year due to corn’s low prices, according to a Marketplace Business story. Alverson says in the story, “Think of any of our budgets across the United States: If we have a 14 percent decline of what’s coming in, yeah, it can definitely have an impact.” Alverson and many of his farming neighbors are expecting to plant a 50/50 mix of corn and soybeans as the profits are expected to be about equal in the near future. The 2014 U.S. planting season will very likely see a near 50/50 split in acreage among corn and soybeans as corn is no longer expected to be a more lucrative crop. 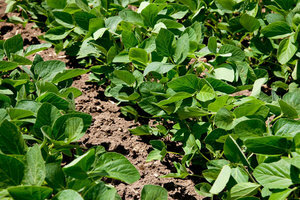 The combination of dropping corn prices driving American farmers to plant more soybeans and large international soybean harvests have caused analysts to predict falling soybean prices in the upcoming months.